A beef tenderloin is one of the most popular cuts of meat because it is boneless and can be cooked into a very tender piece of beef. A marinade made of equal parts oil and acid, such as vinegar or citrus juice, adds tenderness to your beef tenderloin, as well as a strong burst of flavor. After you marinate your beef tenderloin, you can grill, roast or bake it, because it is a versatile cut of beef that responds well to most methods of preparation. Place the extra-virgin olive oil, white vinegar, garlic, onion, garlic powder, rosemary, sage, salt and pepper in a large dish. Whisk them together until well combined. Rinse your beef tenderloin with cold water, and pat it dry with a paper towel. Put your beef tenderloin in the mixture, and turn it with tongs to coat it evenly. Cover the marinating dish tightly with aluminum foil, and place it in the refrigerator. 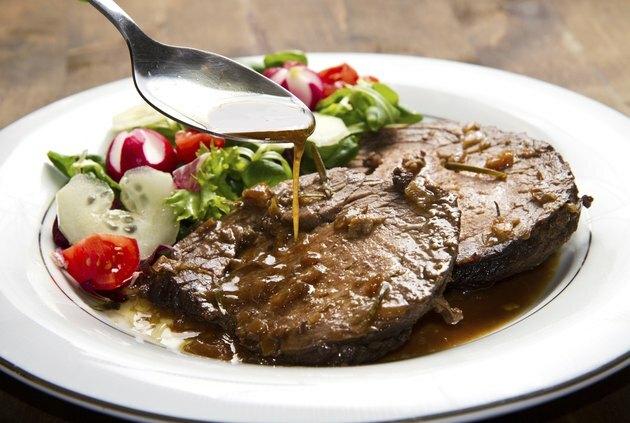 Allow the beef tenderloin to marinate for eight hours, or up to 24 hours. Uncover it once an hour, if possible, and turn the meat. Use a turkey baster to baste the beef with the marinade each time you turn it. Pull the beef tenderloin out of the refrigerator about one hour before you plan to cook it. Leave it in the marinade during this time. If you would prefer, use a different acidic ingredient in your marinade. Replace the white vinegar with red wine, soy sauce or citrus juice. Enzymatic ingredients, such as papaya or pineapple juice can also result in a juicy and tender cut of beef. Put whatever herbs and spices you like in your marinade recipe. Basil, oregano, curry, celery seed, paprika and cayenne powder are all flavorful choices. The olive oil in this recipe can be replaced with canola or vegetable oil for a similar taste and results. Do not use more acid ingredient than oil or add too much salt in this marinade, because these can cause your beef tenderloin to become tough, stringy and dry. How Do I Cook Flank Steak in the Oven?